The logo for General Congregation 36 (GC 36) receives its inspiration from the exhortation of Pope Francis to the Jesuits in the Church of the Gesú in Rome, on September 27, 2014, on the occasion of the 200th anniversary of the restoration of the Society of Jesus. His Holiness encouraged us to know how to discern in the midst of difficult times, to be submissive and obedient to the will of God; and to “row” with Him in the service of the Church in harmony with the call of Jesus to his disciples: “Row out into the deep water” (Lk 5:4). The ship of the Society has been tossed around by the waves and there is nothing surprising in this. Even the boat of Peter can be tossed about today. The night and the powers of darkness are always near. It is tiring to row. The Jesuits must be “brave and expert rowers” (Pius VII, Sollecitudo omnium ecclesiarum): Row then! Row, be strong, even with the headwind! Let us row together in the service of the Church! Let us row together! 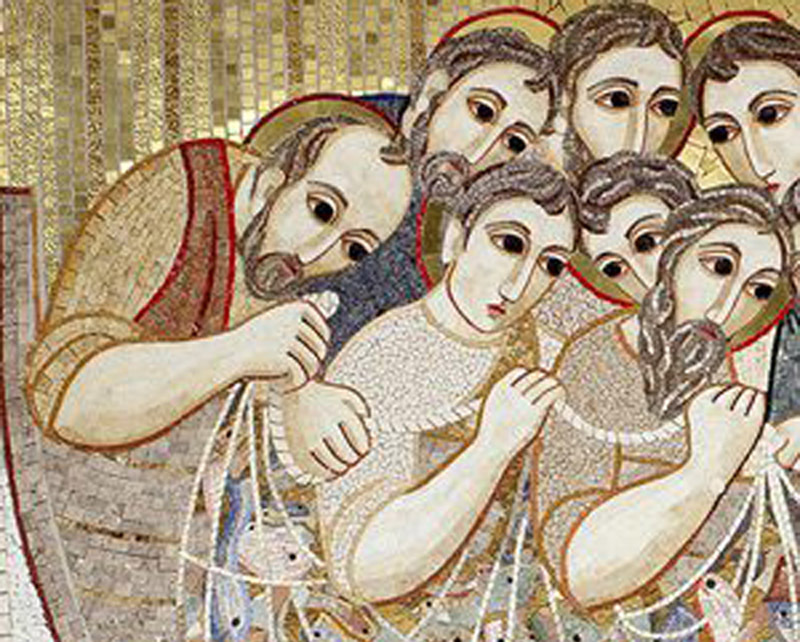 But while we row – we all row, even the Pope rows in the boat of Peter – we must pray a lot: “Lord, save us! Lord save your people.” The Lord, even if we are men of little faith, will save us. Let us hope in the Lord! Let us hope always in the Lord! The designers of the logo are Pablo Fernández S.J. (Chile), and Elías López S.J. (Spain).